Budgets are all about choices. Sinn Féin wants our society to make the right choices. FAMILIES across the 26 Counties are struggling to survive. Many are in personal economic crisis. People are angry and frightened at the prospect of yet another Budget that is shaping up once again to target the least-well-off in society.Parents fear not just for themselves but their children: can they feed and clothe them, can they keep a roof over their heads, can they give them the things kids need every day, will there be jobs for them after school and college, when will they see those who have already had to emigrate to find a future?Austerity isn’t working. 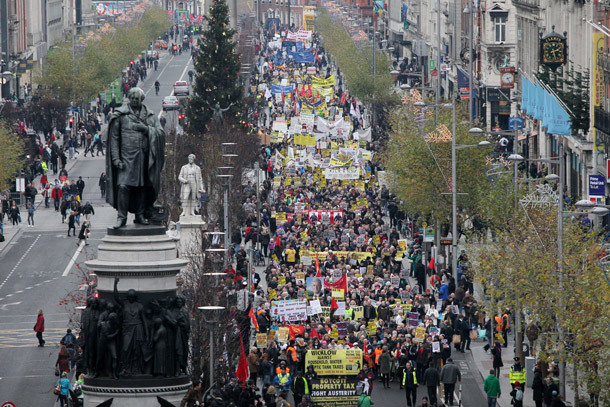 18,000 people turned out on the streets of Dublin to demand that the Government takes a different path. Fine Gael and Labour do not have to continue implementing failed Fianna Fáil policies.There is another, fairer and better way forward.In October, Sinn Féin presented a comprehensive jobs plan that concentrated on bringing growth and employment back into the economy. In November, the party launched its Alternative Budget, Making the Right Choices. Based on figures provided by the Department of Finance, Sinn Féin produced a clear, costed analysis of where and how the Government can still make the right choices in the Budget to protect families, frontline services and jobs. Early next year, Sinn Féin will launch proposals on the banking sector, including curtailing bankers’ already high pay and getting the banks lending again.The irony of Fine Gael and Labour imposing a Property Tax on people crippled by debt and in negativity equity from a burst property bubble that had been inflated by speculators, bankers and the media seems to be lost on Government TDs. Sinn Féin’s proposal of a Wealth Tax is a fairer and more productive way forward. Wealth Tax legislation will be published by Sinn Féin in the week after the Budget.Budgets are all about choices. Sinn Féin wants our society to make the right choices. Fairness means increasing taxes for the wealthy, protecting struggling families and cuts starting at the top. The Property Tax will be the last straw for struggling householders and will be extremely difficult to implement, whereas a Wealth Tax is both fair and easy to implement. There is no excuse for making the wrong choices. A fair Budget is possible. Sinn Féin has shown how.